Constituting the largest reference work on "Doctor Who" ever written, the six-volume "About Time" strives to become the ultimate reference guide to the world’s longest-running science fiction program. 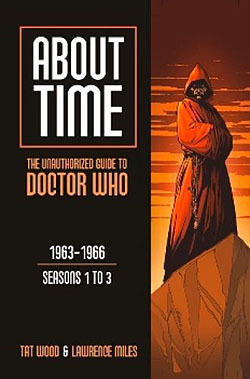 Written by Lawrence Miles ("Faction Paradox") and long-time sci-fi commentator Tat Wood, "About Time" focuses on the continuity of "Doctor Who" (its characters, alien races and the like), but also examines the show as a work of social commentary. In particular, Miles and Wood dissect the politics and social issues that shaped the show during its unprecedented 26-year run (from 1963 to 1989), detailing how the issues of the day influenced this series. As part of this grand opus, About Time 1 examines "Doctor Who" Seasons 1 to 3 (1963 to 1966) -- the show's every beginnings, with William Hartnell in the lead role. Among other things, About Time 1 answers such vitally important "Who" questions as "Can You Change History, Even One Line? ", "What's the Timeline of the Daleks?" and "Is His Name Really Who?"